Federal Research-and-Production Center Joint-Stock Company ‘Research-and-Production Association ‘Mars’ celebrated its 50-year anniversary on March 13, 2011. Our Company was founded in 1961. Just then, on the basis of Ulyanovsk Machine-Building Plant named after Volodarsky, a branch of Naval Research Institute No1 was established in Ulyanovsk. Due to the intensive development, we managed to achieve the independence in a relatively short time. In 1970, the Company was reorganized to a self-sufficient research institute. At the beginning of 2006, during the privatization, our Company was awarded the status ‘Federal Research-and-Production Center Open Joint-Stock Company ‘Research-and-Production Association ‘Mars’. From the very beginning, during all the years of the dynamic activity, our work field has not changed. And at present day, we are involved in design, creation and service of computer-aided systems for geographically-distributed authorities of the Russian Navy, information-management systems for different-class vessels and ships, base general-purpose training systems for training of the Navy specialists, and computer-aided facilities for national-security agencies. Our personnel created several generations of the basic systems for surface ships: ‘Alleya’, ‘Lesorub’, ‘Tron’, ‘Diplomant’. 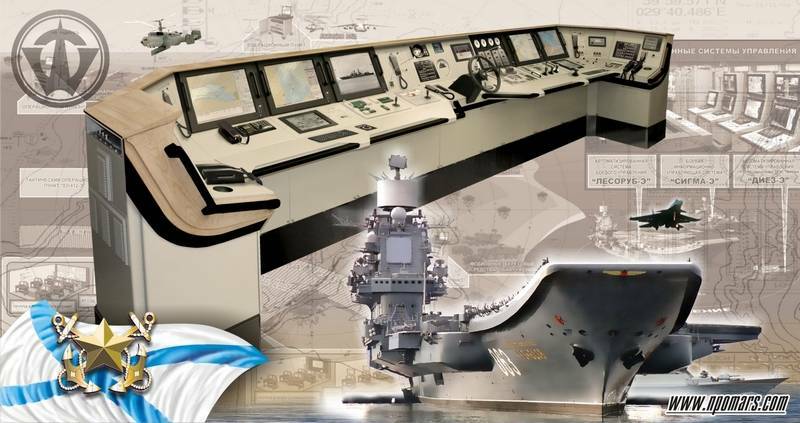 The last-generation systems are the ‘Sigma’, ‘Diez’ systems and Integrated Bridge Control System. Thanks to our experience we develop systems for aircraft carriers from aircraft carrier to assault helicopter-carrier dockship. Our shore-based sector also broadens the scope in the course of time: from a small part of work in 60s to complexes of geographically-distributed computer-aided C2 system and even integrated computer-aided C2 system for the Armed Forces. Nowadays, Mars is a state-of-the-art company with the rich research and production potential respected and appreciated by the Navy. We have everything required for the successful work: high-skilled specialists who mastered new technologies for development of the most complicated systems and present-day production. The development is carried out using Russian- and foreign-origin hardware components, combining top-notch technologies of design and production as per severe military-standard requirements. There remains one important nuance: Mars is one of few Russian companies which are full-cycle manufacturers of electronics. All the devices that are components of the systems to be supplied to both Russian and export ships, are of the own production. We develop and produce special-purpose computer aids, electronic modules, printed-circuit boards, rugged monitors, and perform special studies and tests. Our electronic components are supplied to various regions of Russia: the up-to-date technological base for the production of printed-circuit boards enables to produce single-sided, double-sided and multi-layer (up to 26 layers) PCBs meeting to Russian and international standards. Five years ago we started a mechanism of involving the personnel in the innovation activity: each engineering specialist takes part in planning to create new products and improve activities. The result is evident: Mars has been developing stably and dynamically during recent years. The product yield has been growing; we have been creating new vacancies to be filled, and performing the re-equipment both within Federal Target Programmes and at the expense of our own funds. The number of our scientists at the Company has been also growing. 5 Doctors of Science and 41 Candidates of Science are in our staff. Their papers are published in the journal ‘Automation of Combat, Control and Management Processes’ that has a status of the Highest Certification Committee. Our activity had and now has an essential feature: almost all the products depend fully on the essence and destination of the objects they are created to equip. The individual approach to each subsequent product and joint work with Customers make our products more adapted to fast-changing present-day reality. To the point, at the beginning of the new millennium, our two activity sectors (creation of computer-aided C2 systems for surface ships and task forces, and computer-aided C2 systems for shore-based command posts of the Navy) started their ‘fusion’. Our aim is to create the integrated computer-aided C2 system of the Navy which can be a computer-aided C2 system of any strategic level of any state. A large number of our all-level awards and grateful letters from fleets confirm the high level of our products which proved themselves well not only in standard situations but also in real combat environment. Today we are open for cooperation and ready to consider any particular offer from Customers. Our experience and knowledge will help us to make your fleet more powerful and equipped.